Summaries are difficult to teach. For a summary to be effective, several reading and writing skills must align. On the reading side, students need to identify purpose and audience, understand text organization, and distinguish between main ideas, major supporting points, and minor details. On the writing side, they require skills in paraphrasing, writing a topic sentence, introducing major supporting details, and using appropriate grammar and vocabulary. When I teach my students summary writing, they can easily become frustrated because they do not know where to start. Also, quite frankly, they find them, well, boring. One way I’ve tried to scaffold and liven up summary writing is by using interactive summaries. Here students use pictures, sentence stems, and each other to build a summary together orally before writing one on paper. 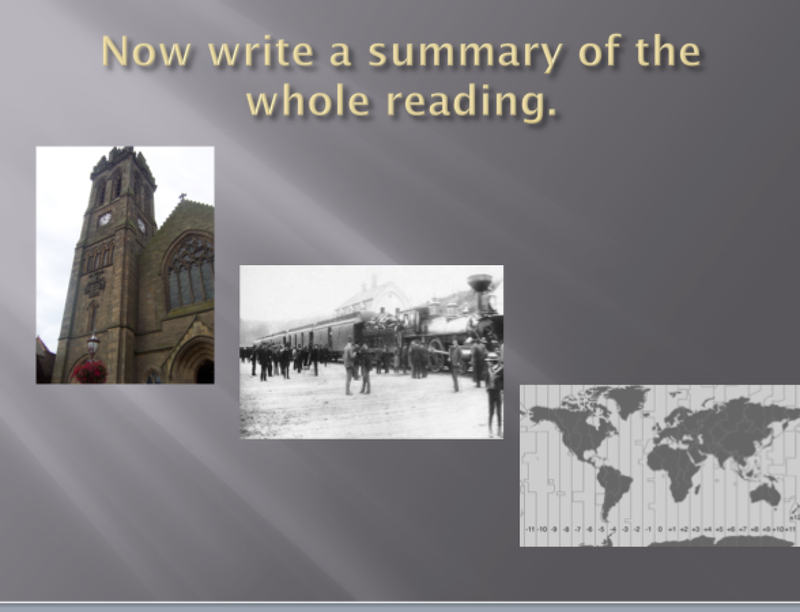 Create a PowerPoint that includes images representing the major sections (main points) of the reading. Use one image per slide. To the right of each image, include a sentence stem that includes language students need to frame their part of the summary. Add an additional stem if necessary. Tell students they are going to work with a partner to summarize the different parts of the reading. Student A is looking at the PowerPoint. Student B has his or her back to the screen. Show the first slide. Student A uses the picture and the sentence stem to summarize the first section of the reading. Student B listens. Partners switch places, and the teacher shows the next slide. Student B uses the next picture to summarize the second section. Student A listens. Switching repeats until all images have been shown. I usually choose 5-6 images in total. Partners then work together to write a summary of the whole reading. A final slide may show all the images again to aid students in recalling the main points. Teacher facilitates as necessary and collects the summaries. 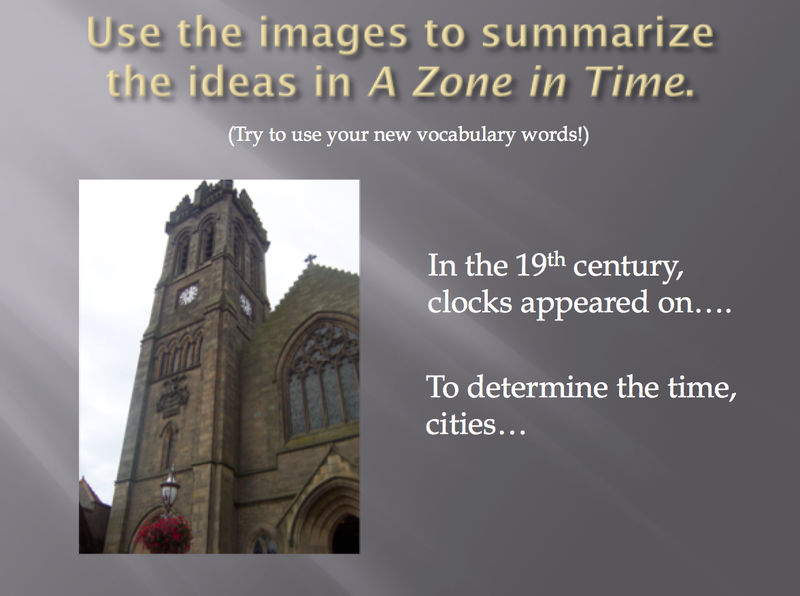 Last week, I used this strategy after my students completed a reading on the history of time zones from the textbook From Reading to Writing 4 (Pearson). 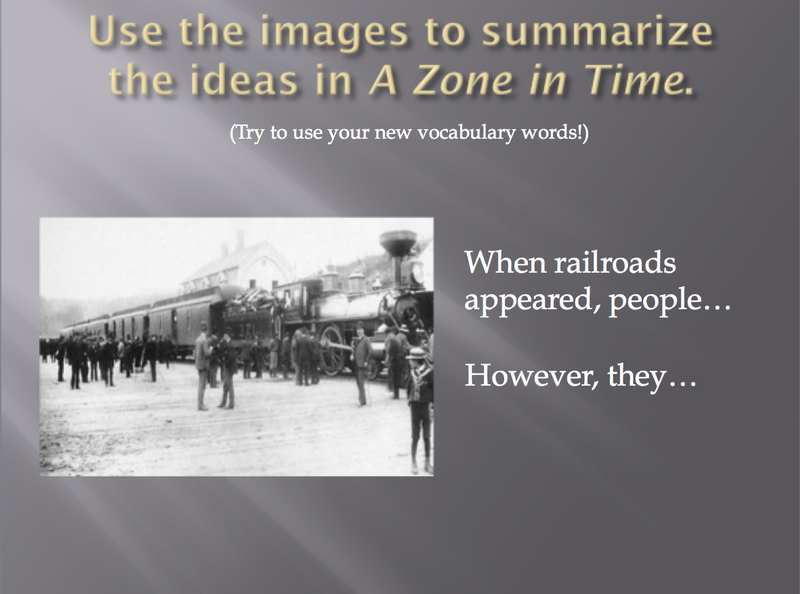 Here are a few of the slides I used, with notes on the kinds of sentences my students produced. “In the 19th century, clocks appeared on prominent buildings. To determine the time, cities used the sun. In the 19th century, clocks appeared on prominent buildings. To determine the time, cities used the sun. When railroads appeared, people needed to catch their train on time. However, they often missed their train because cities were on different times. 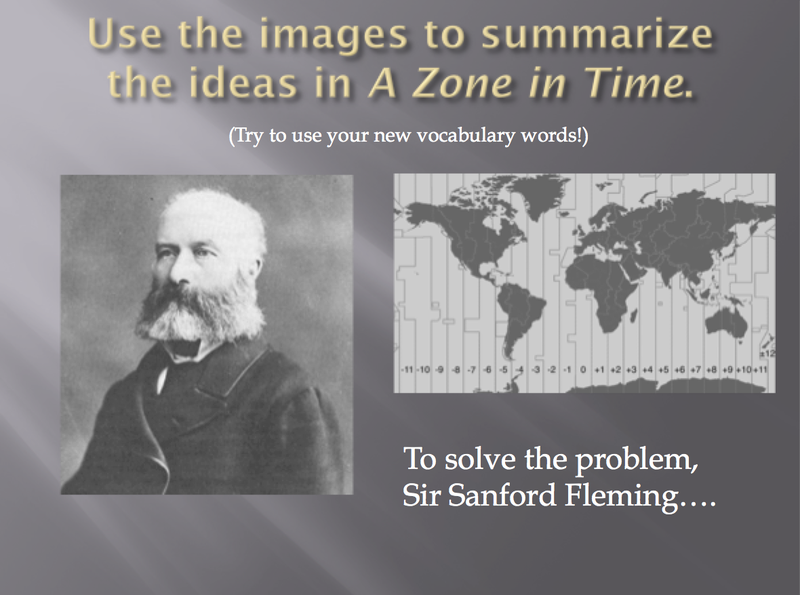 To solve the problem, Sir Sanford Fleming invented time zones so that all cities and towns could be synchronized. Interactive summaries offer some advantages. The images give students a cognitive hook to help them recall the ideas from the reading, and the stems give students just enough language to frame their ideas. Because they are interactive, students are actively listening and monitoring what they are saying, working their ideas out orally before putting them into writing. Interactive summaries are also a way to get students’ eyes off the text, which can help prevent plagiarism. Last but not least, the pictures and communicative gaps help to breathe a little life into the task of summarizing. Thanks for the great ideas. I can use right aways the one about thinking outside the paragraph and also the one on summaries!! Just made my job as I prepare my lesson plans a little easier! !